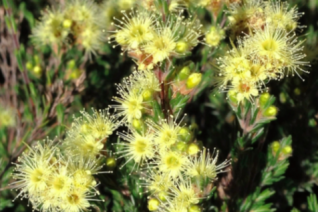 Yellow Mountain Kunzea is a rare alpine shrub from the very highest and coldest mountains and frosty valleys in the Australian Alps. A very fine textured low shrub with tiny gray leaves that most closely resemble an Erica. To 1′ x 3′ spreading in full sun and rich soil with regular summer irrigation. Bloom is a swarm of starry, stamen laden light yellow flowers. They can obscure the foliage in late spring. Not the easiest plant to establish and virtually unheard of in the United States. A little patience and some diligent water and you are good to go. Perfectly hardy to cold west of the Cascades. A beautiful member of the myrtle family that we are excited to have for sale. Moderate deer resistance.